Most people know very little about public procurement — yet it shapes everything from education to health to transport, and represents up to 30% of developing countries’ GDP. 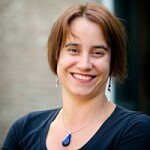 To find out more about this important but overlooked subject, Dr. Mindel van de Laar spoke to PhD fellow Ana Cristina Calderon Ramirez, whose research looks at the structure and efficiency of public procurement in Latin America. Can you tell us about your current employer and what your daily job looks like? AC: I work at the Inter-American Development Bank (IDB), a regional multilateral institution that is currently the leading source of development financing for Latin America and the Caribbean. We work to improve lives in our region by reducing poverty, strengthening the public sector, improving infrastructure education, health and social protection, among other areas. I work in the Fiscal and Municipal Management Division and I am part of the Public Expenditure Modernization team. Our objective is to provide loans, grants and specialised technical assistance to reform and modernise public expenditure systems in our 26 beneficiary member countries. My daily work involves engaging public officials in IDB member countries, as well as international experts in organisations such as the World Bank, IFC, OECD and other regional development banks, to develop initiatives aimed at increasing efficiency, effectiveness and transparency in public procurement systems. This includes the preparation of strategies, sector policies, guidelines and conducting relevant analytical work. Additionally, I coordinate events that bring together academics and practitioners to further the knowledge frontier in our area of expertise. Some of these topics include: measuring the performance of public procurement systems, the role and effects of institutional capacity in the effectiveness of procurement processes, the use of public procurement as a tool for achieving social outcomes, the introduction of innovative business models, and the relationship between procurement and governance. I enjoy working to strengthen public procurement systems because increasing their efficiency effectiveness and transparency directly impact the quality of governments, and also because the strategic function of procured goods, works and services is essential for the provision of citizen services, and therefore, people’s lives. Let me put it another way: All of us, at some point in our lives, make procurement decisions. And we like to make good decisions, right? 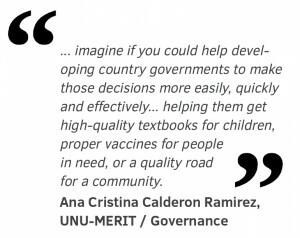 Well, imagine if you could help developing country governments to make those decisions more easily, quickly and effectively? That would mean helping them get high-quality textbooks for children, proper vaccines for people in need, or a quality road for a community. Makes sense, doesn’t it? This is what makes my job meaningful! You enrolled in the dual career PhD programme in Governance and Policy Analysis. This is a very ambitious programme, combining work and doing your PhD. How do you integrate both activities in your life, and balance home, work and the PhD? AC: In all honesty, it’s not easy to juggle all these elements – but life is full of challenges. I think the most important ingredient when striving to write a PhD dissertation is passion, and combining it with discipline, persistence, resilience and being organised, is the key to maintaining a balance both at home and at work. I have made efforts to develop a schedule that enables me to allocate time for the wide array of activities that a PhD programme and a full-time job demand, including a lot … and I mean A LOT of meetings, documents preparation and travelling to different countries. As noted above, being organised has been key. Thankfully, part of my research is related to my day-to-day duties at work, and that has enabled me to take advantage of the inherent synergies that this creates. I am more effective at work thanks to the things I learned through the PhD programme and during the dissertation journey, and I have been able to observe and explore first-hand with my clients all the knowledge and theories that I am being exposed to. Finally and more importantly, I am also very fortunate to have the support of friends and family who have encouraged me to undertake this programme and have been understanding of my need to arrange my time with them around it. All these factors help me maintain the necessary balance in my personal and professional life. You work specifically on the creation and development of public procurement agencies in Latin America. What drew you to this subject, and how does it tie in with your current role? AC: I must say that my interest in the topic is based on my professional expertise and my personal background. In order to elaborate on that, first I would like to invite you to think for a moment: have you ever heard about public programmes like ‘school breakfast’, ‘vaccines for children’ or ‘no child left behind’? Have you ever wondered how those breakfasts, vaccines or schools are placed efficiently? Have you wondered how the government is investing your taxes in making those goods, services and works available to citizens? Well if so, you may find that public procurement is an essential key to answer those questions. In other words, it’s relevant because it’s part of our daily lives. 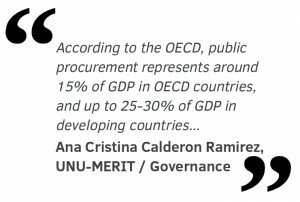 According to the OECD, public procurement represents around 15% of GDP in OECD countries, and up to 25-30% of GDP in developing countries, and its main added value is focused on its capacity to increase value for money, improve public service delivery, and create more competition for the private sector, and all of those – sometimes – at once. At my work I’ve witnessed the relevance of this issue, as Latin American and Caribbean countries, with the support of the IDB (my current employer), have embarked on reforms to make their procurement systems more transparent, efficient and effective. Countries have changed their laws, they have introduced information and communication technologies to their procurement systems, and some have created institutional bodies to take charge of providing advice to contracting entities, monitoring public procurement information, managing statistical databases, providing implementation tools and documents to support training and capacity development of implementing staff, among other responsibilities. That last dimension mentioned above, made me reflect how those bodies have been created and established; what conditions triggered such creation; if there is a predetermined set of conditions that explain the phenomenon and furthermore what are the probabilities of creating entities with those characteristics in countries that are living through those conditions? From my personal background I have a fascination with the public sector, and being a Colombian citizen myself I have understood the importance of the government as a provider of basic services in developing countries. In the case of procurement agencies, Colombia recently created a procurement entity and I want to explore how that process was carried out, what conditions make it possible, why it was done in a certain way and how my government is working towards being more transparent and efficient. Anticipating a good ending, how do you expect your PhD will serve you in your career? AC: I am sure that the PhD and the journey itself have already been helpful. I am a development practitioner and this journey has helped me find coherence between practice and research, between evidence and assumptions, between the ‘accustomed’ discourses from the international community to a more in-depth analysis. I feel more confident when providing advice to the governments that I work with. Of course being a PhD is also important if you want to advance in your career: it opens so many professional doors! Not only does it help you develop more advanced skills related to a profession, but when applying for a job, a PhD preparation makes you stand out more from the rest. And it additionally expands your personal and professional network. Even though it is already paying off for me professionally — and I have so much to do before finishing my dissertation — the most important thing for me is that I will get a sense of accomplishment as I prove to myself that I am able to deal with a very complex task, by myself and that I will make a contribution that will enable a deeper understanding of the topic that I am working on, which in my case is to understand the usually ‘misunderstood and underestimated child in the classroom’: public procurement.